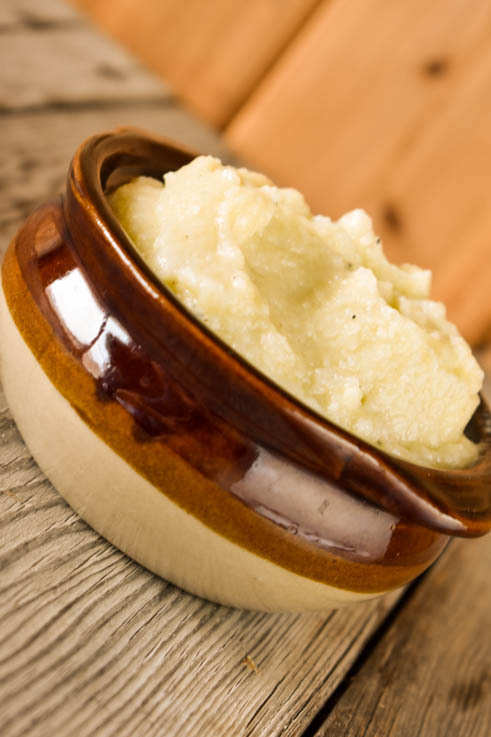 When you need a quick side dish for dinner, try this Instant Pot Low-Carb Mashed Cauliflower in place of a potato side dish. One head of cauliflower yields four small servings (or two large servings) but this recipe is easily doubled to make a family-sized side dish. Oh, how we love potatoes in our family, especially mashed potatoes. We are also looking at ways to go lower carb when we can. One of the most missed foods on a low carb or keto diet is, of course, potatoes. Here is a quick recipe for Low-Carb Mashed Cauliflower in the Instant Pot (electric pressure cooker) that will make you think you are eating mashed potatoes. Cauliflower only has 2.9 net carbs per cup, and it is high in fiber. That’s a double win. This recipe uses one head of cauliflower which makes enough for four small servings. If you want to serve a large family or make some for later, go ahead and double. Add chicken broth and cauliflower florets to the insert for your electric pressure cooker or Instant Pot. Remove the lid, and turn pressure cooker to Saute mode. Add olive oil, garlic, salt and pepper.